The only way that I don't lose my mind is through organization and planning. I have always been a organized person and a planner and running a blog these two qualities are so necessary in running a smooth platform. 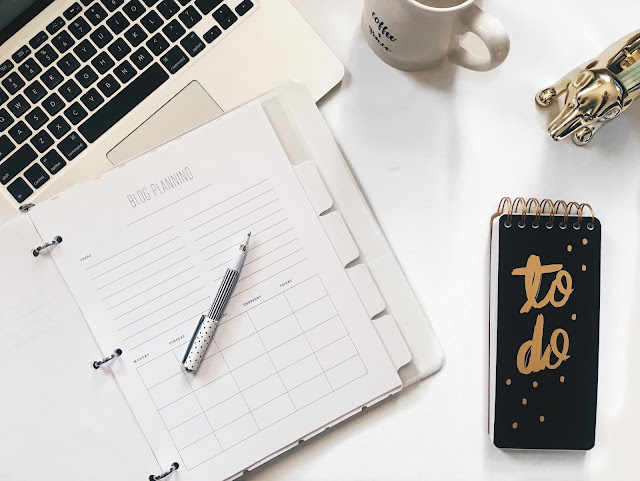 When I first started my blog I didn't have an editorial calendar so there would be days that I would stress about what to post for that week! I would find myself stressed out, anxious and a lot times feeling like giving up on blogging. I keep a small pink Kate Spade notebook on me at all times in case an idea comes across that needs to be immediately jotted down. I have short term memory lose similar to Dory and if I don't write something down I will forget! Once you write all your ideas down for the month then you can go through them and place them into categorical themes and chronological post series order. A great resource tool is studying your blog's analytics. Use this resource to track which posts receive the most traffic and engagement and when your blog receives the most views (such as day of the week) etc. This will also help you with your content and what to post. I'm learning that you have to get to know your audience, and how to do this is to track their trends and interests through analytics. I am a writer and a visual person so I like to write down my ideas and content in my calendar. Others like to type and use Google Drive Calendar or the app Evernote. If your like me and want to write there is no shortage on the Internet or Pinterest for Editorial Calendar Templates. I found a editorial calendar template online from blogger Emformarvelous. It fits my organizational style and planning tools. At the top is allows space for ideas and the bottom portion is the calendar Monday - Friday. I like it because everything for that month is there on one page and visually it allows me to organize my content and not have to flip back and forth from one page to another. Another great thing about EmforMarvelous template is that you can personalize the calendar. I got a white binder and pretty graphic dividers and add my own personal touches. Everyone works ahead differently depending on a number of factors and for me I try to stay at least two weeks ahead. My calendar is filled out with ideas but I like my photos and finalized drafted post complete so I can post accordingly to my calendar. When scheduling my posts I like to spread them out. So typically I post on Mondays and Wednesdays or possibly Thursdays. If I can get 3 posts up in one week thats great but I prefer to post quality content over quality. This method decreases feelings of stress and the anxiousness of feeling like you have to catch up. This can be discouraging and your blog will begin to feel like a dreadful job as oppose to a dream job. You want to provide for both yourself and your readers the satisfying feeling of delivering quality content that you are proud of. Its hard to deliver value with last minute planning and ideas. You need to allow your mind to think thoroughly and let those creative juices flow. Having a organized content process is helpful for social media strategy and planning. Your social media is a huge part of your brand and when your posts are organized you can then plan your social media calendar as well. I hope this post was helpful for you guys and if you enjoy these kind of posts please share your feelings down below and let me know what your blog content planning process is. The biggest competition is myself. I am not looking to follow others or pull them down. I'm planning to test my own boundaries. See the link below for more info.